Rock Those Jingle Bells-Original song, words and music by DeDe & traditional. Copyright 2013 by Deborah DeDe Wedekind. In a one horse open sleigh? O'er the fields we go? Bells on bob tails ring? What fun it is to ride and sing? Oh, jingle bells, jingle bells? Oh, what fun it is to ride? A day or two ago? I thought I'd take a ride? Was seated by my side? The horse was lean and mean? We got into a drift of snow? And bounced around a lot. With all our friends tonight! Rock them all the way? A new Christmas Classic of "world music" proportions! 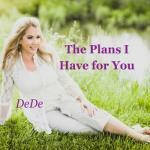 Original melody, lyrics and medley, written by Deborah "DeDe" Wedekind. Copyright Deborah Wedekind, all rights reserved. Original medley by DeDe (Deborah Wedekind) with original lyrics and music. Copyright 2013 by Deborah Wedekind. Il est ne le divine enfant. Song of blessing and hope for Christmas about how one tiny child can change the whole world. Original new Christmas song by DeDe, that starts slowly and tenderly, then gradually builds to a world beat chorus! With the LA Children's Choir & Produced by Grammy winner, Jeff Bova. Christ was born our world to save. Hauntingly beautiful & complexly woven new medley by Deborah DeDe Wedekind using the 2 most beloved Ave Maria Melodies by Gounod & Schubert. 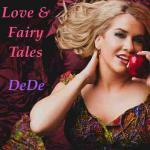 DeDe creates an all new version with her stunning new medley. A trio for 2 sopranos & cello, all harmonies, all new outro and cello parts written by DeDe. New music and medley copyright 2013 Deborah DeDe Wedekind Original NEW Song by Deborah DeDe Wedekind. Words and Lyrics by Deborah Wedekind & traditional. By Deborah DeDe Wedekind, Copyright 2013. 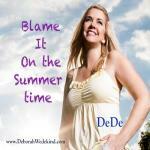 Original NEW Song by Deborah DeDe Wedekind. Words and Lyrics by Deborah Wedekind & traditional (F. Schubert and Gounod). 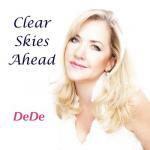 New Music & Medley by Deborah DeDe Wedekind, Copyright 2013. DeDe conceived this Christmas pop-country Americana song while preparing for her Christmas show last year. This song asks us all- what is your gift to the world this Christmas? Reminding us that we need to pause at Christmastime, and show our gratitude for all of the blessings we have, by sharing with others who may not be so fortunate around the world. This Americana pop song is about the joy of giving back at Christmastime. One of DeDe's biggest influences is Elton John, so DeDe used a lot of Elton John-like chord progressions on the chorus. Guitar by Tim Pierce who has played for Bruce Springsteen, bass guitar by John Pierce who currently tours with Huey Lewis & the News. Drums by Denny Fongheiser of Bliss Music and who played for Elton John's The Lion King. By Grammy Winning Producer, Jeff Bova (Celine Dion, Falling into You-1996). Can't you hear the joyful sound? But do we all have hope? And do we all have wonder? Compassion to a world in need of comfort. But will everyone find peace and hope and love? Will you show them all the joy they're dreaming of? It's the best season around. When will we all find peace and hope and love? What is your gift to your world, this Christmas? Fa la la la la, la la la la.??? Fa la la la la, la la la la.? No duplication, performance, sale, uploading, use, copying or downloading with out express permission of copyright owner. On earth as in Heav'n. Who have sinned against us. Power and glory forever and forever. DeDe wanted to do a cool retro rockabilly version of Jingle Bells but felt the lyrics were a bit out dated. So she wrote some new lyrics, added a cool new bridge and beat. Then she got the best musicians & producer that money could buy, to make this spectacular new classic Rock and Roll version reminiscent of Elvis Presley & Brenda Lee! -Copyright 2013 from DeDe's award winning and 5 star album: the 2014 IMEA HOLIDAY ALBUM of the YEAR, World of Christmas, (Nov. 2013). 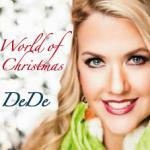 World of Christmas by DeDe won BEST HOLIDAY ALBUM of the YEAR in the 2014 IMEA Awards in Oct. 2014! by Deborah DeDe Wedekind, from World of Christmas copyright 2013. Lyric version-Joyful Christmas a song of hope. Happy, joyful, peaceful, relaxed, content.